In 2012 Patrick Smith followed his wife to Ithaca, New York, where she was working on her PhD. He was working in IT at the time. A part of him wanted to get into the bar industry, but he had doubts. He started working seventy hours a week, taking on a second job behind the bar at Stella’s, a local restaurant that catered to Cornell students. One day he noticed that the bar served Dogfish Head 90 Minute IPA in pint glasses. This struck him as peculiar. 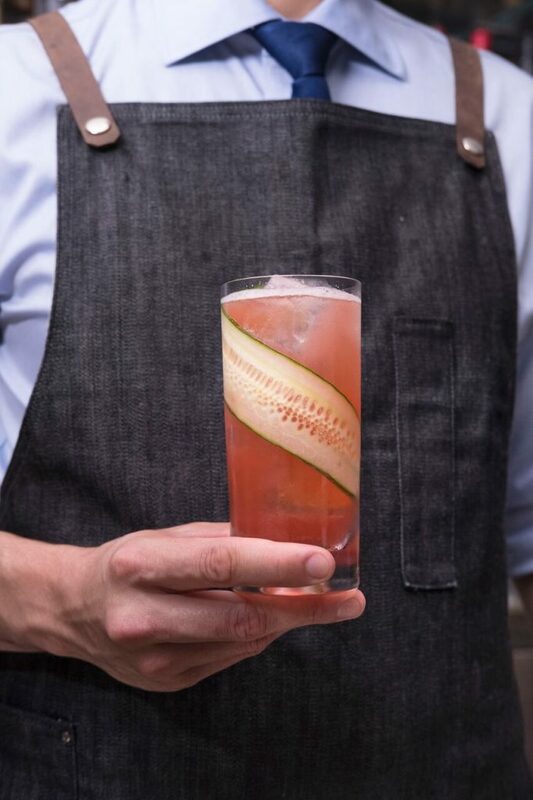 Smith and his team bring the same sense of wonder and precision to the drinks program. The current menu draws ingredients from around the world—drinks made with shochu, mezcal and aquavit—presented in familiar yet novel ways. Even classics may arrive with something extra. I am forced to concur. On a recent visit to the Modern, Smith prepared me four astonishingly well-made baijiu cocktails. Three were riffs on classics—a Pimm’s Cup, a Jungle Bird and a Negroni—and the other was a Modern original, the Terracotta Navy. They were flavorful, balanced and complex, but none was more complicated than it needed to be. Smith showed me a side of baijiu I wasn’t expecting. He showed that baijiu has a place not just behind the bar, but in a fine-dining setting. I followed up later to learn more about the Modern’s beverage program, Smith’s approach to flavor, and mixing with Chinese spirits. 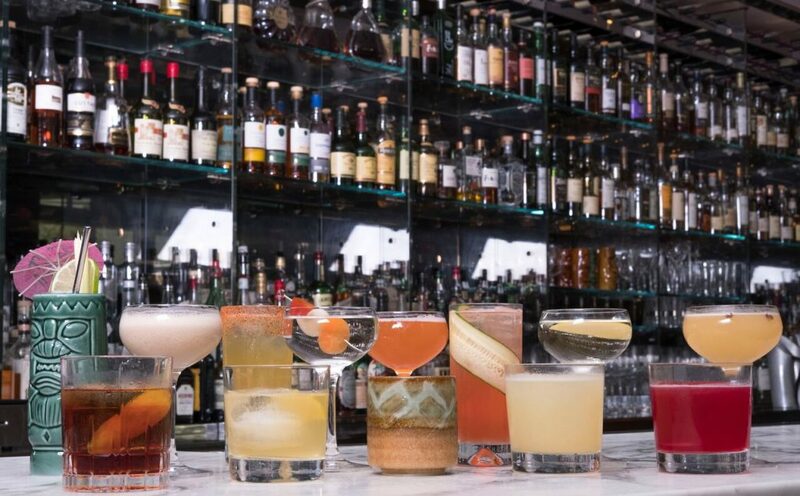 The drink lineup at the Modern. Drink Baijiu: What kind of drinks are you most drawn to? What’s your approach to drinks and greatest passion within the mixology world? Patrick Smith: First and foremost, I’m going to look for balance and flavor. If you look at it like food, I would say good food will have components of your classic flavors—sweet, salty, acidic, bitter, fat, and so on—and I kind of look at drinks in the same way. As long as the drink is well balanced and has products with integrity in it, at that point I’m a little more into the technique behind it: how it was made, did you use the right ice, did you shake it properly, how’s that foamy, frothy head of the aeration of the drink, how refreshing is it, things like that. DB: Is there an overriding theme that runs throughout the drinks at the Modern? PS: I think we’re trying to just do a nice cross-section of the different things that the world of spirits has to offer right now—different categories of spirit all across the board, some weird stuff. Obviously we’re working with baijiu, which we’re very happy to do. DB: Does the Modern’s reputation afford your team more creative space? PS: We’re basically given the keys to the kingdom when it comes to the cocktail program. It’s all done under my team’s creative energy, and we’re given a perpetual green light from our management team, which I really appreciate. So I brought the concept of baijiu to them, and they just said ‘Great. Go with it.’ I never really felt the need to clear anything. We’re given a lot of trust, is what I’m trying to say, to develop our own aesthetic and develop our own brand. So to answer your question: Absolutely. We view it as an opportunity to do whatever hits our creative energy at the moment, and we’re very fortunate for that. DB: When did you first encounter baijiu, and what did you think about it? PS: We have this big final test, a sort of ceremonial final exam that the barback takes [and after it] we all decided to go out on the town, those of us who weren’t working that day, and we wound up at this dim sum restaurant. One of our other bartenders, who had been to Beijing before, said “Well obviously we gotta get a bottle of baijiu.” We were thrown right into the fire with the way it’s supposed to be drank traditionally, with food and with friends, and with Chinese food to boot. Definitely a memorable experience. Then I went to Beijing last June. 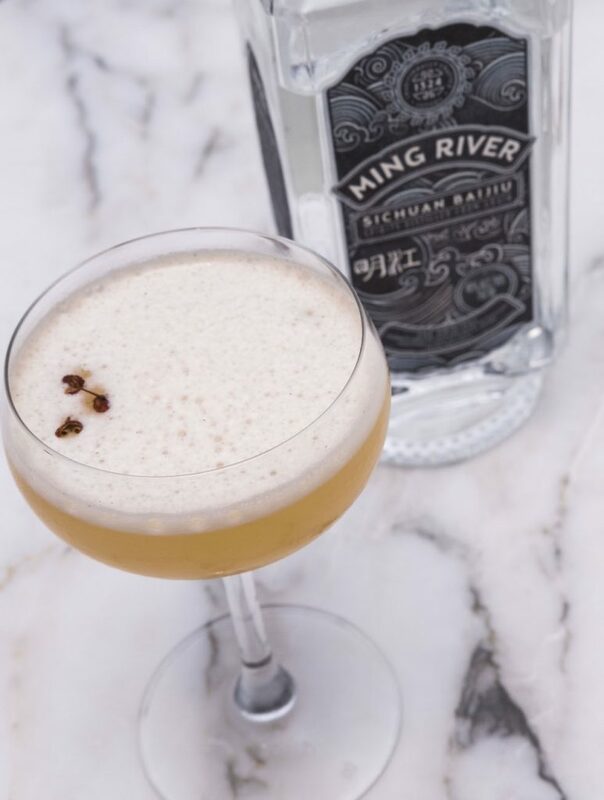 I was told there was a baijiu-specific cocktail bar in Beijing, called Capital Spirits, so we designed an evening around going there. They were just starting to wrap up for the night, but they very graciously let us in and let us have a round. We tried sort of a cross-section of some of their drinks with the different aromas and I had the Paper Crane, which I enjoyed very much. 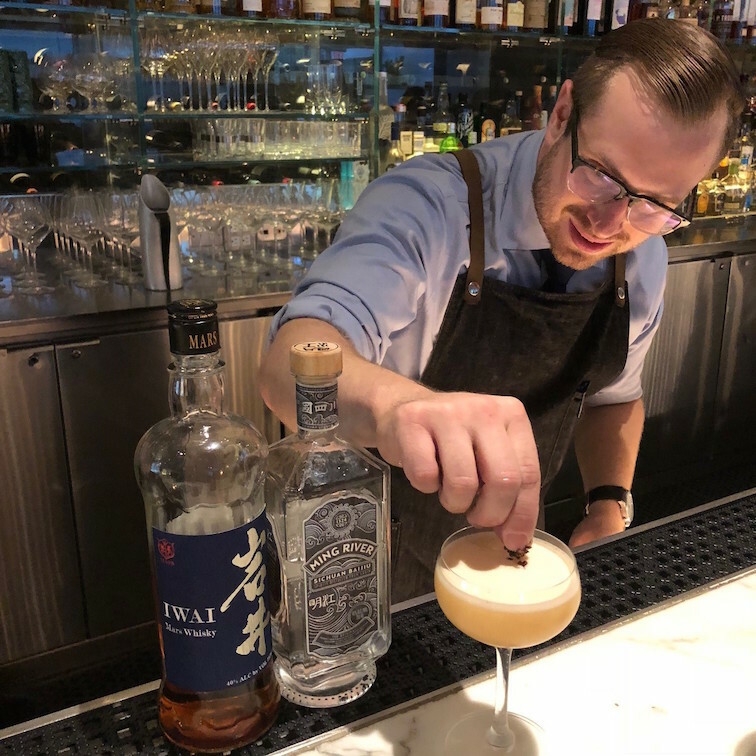 I got to speaking with some of the bar staff and mentioned my role in the bar community in New York City, and that I was interested in learning more about baijiu and how to source it in the United States and what I might be able to do with it at my place of work. They got very excited about that and were trying me out on all these strange baijius, and so that was one the highlights of the trip certainly. DB: What are you getting from baijiu that you’re not getting from other parts of your backbar? PS: I view myself as a completionist when it comes to almost everything in life. Sometimes it’s to the detriment of the eye-rolling of my colleagues, but I really want to view any bar I’m associated with as a representative sample of what the world of spirits has to offer. So getting baijiu onto our backbar is obviously very, very helpful in that. As we know it’s an incredibly popular spirit in the world. As far as cocktails go, I think you are spot on in treating it like a funky Jamaican rum, or even having some elements of [rhum] agricole. In terms of a Western palate, if you’re looking for things to compare it to, I think those are the first initial comparisons. Any time someone tries it and says ‘The first thing that I want to do is throw it in a tiki drink,’ I totally get that and think it makes a ton of sense. I mean tiki is a world of very strong flavors, and I think baijiu signals these tropical things—your passionfruit, even some of your absinthe in the world, and these tiki drinks can bring out some of that anise flavor that’s in baijiu. What we wound up doing is using it in a whiskey sour variation. I wanted to get back to my philosophy of producing a cocktail with integrity at its core—not trying to get too, too complicated with it in terms of the number of ingredients, but having technique and balance be at the center of it. The tiki thing is spot on, and I think from there that’s maybe kind of a gateway. 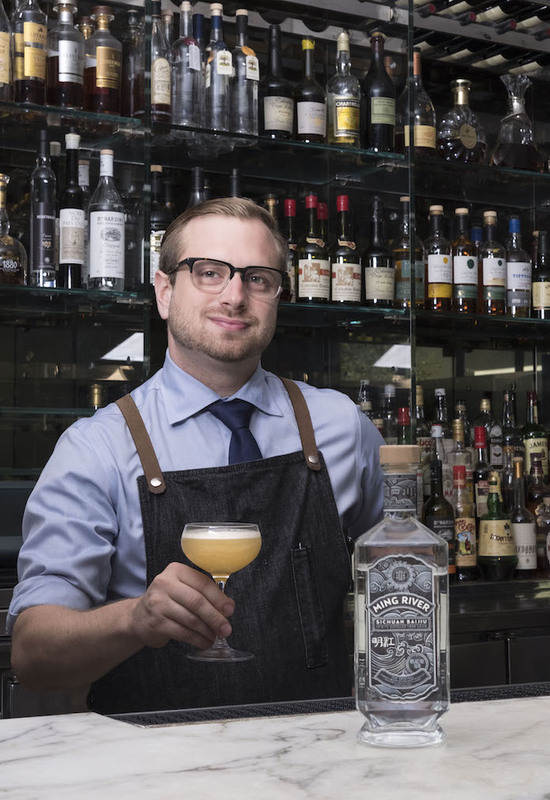 From there you’re trying to pick out your secondary flavors in whatever baijiu you’re working with and then at that point you’re treating it like any other cocktail: You’re linking flavors together. Kind of treat it like an alcoholic version of the Flavor Bible, where whatever flavor you’re picking out in the baijiu, if you’re picking out an anisette flavor, maybe you look to prepare it with an absinthe, for example. DB: I was really impressed by the versatility of the drinks you served me. What surprised me most is that I’ve seen a ton of bartenders try to crack the baijiu Negroni, and none of them quite got there. Besides yours, I’ve never been served a baijiu Negroni that was as satisfying as a gin Negroni. And it was also the simplest: You simply swapped out gin for baijiu. This shows me you don’t feel the need to overcomplicate. PS: I’m definitely not shying away from ingredients. Yeah, I’ll put baijiu in a Negroni. Why not? If we’re going to make a baijiu Negroni, let’s make a baijiu Negroni. Let’s not beat around the bush. Just like everything else I’ve been talking about, it’s about products with integrity. It has the flavor it has and it goes with things, just like any cocktail ingredient. Let’s not handicap it. Let’s not mask it or hide it. Let’s celebrate it, and let’s put it with some cool flavors and see what happens. DB: What is your greatest success or discovery in working with baijiu? PS: I gotta just shout out our Terracotta Navy. We’re really happy with it. It was definitely a team effort. A lot of our other bar staff had input into some of the flavors. You know we were going to mix it with sherry, we were going to mix it with different things, and had a couple of iterations before we really felt like we nailed it. That collaborative process is something I’m really excited and happy [about] and proud of at the Modern. We were really, I feel, able to nail that one. That’s my proudest and happiest moment working with [baijiu] so far. DB: And are people ordering it? PS: Last night was an all hands on deck situation, so I was behind the bar helping out our team. We have five people behind the bar, which is a lot, but we made it happen. At our service bar we had a large group of people sit in our lounge. As I recall they started with a bunch of highballs, gin and tonics, and what have you, maybe a couple of beers thrown in there—a pretty standard ticket for us. And then their second round, this ticket prints, and it says five Terracotta Navies. And that’s the whole of it. I was like, ‘Holy crap!’ That’s amazing that we got this group of Midtown businesspeople to come around to this cocktail, and order five of them blind. That really blew me away. 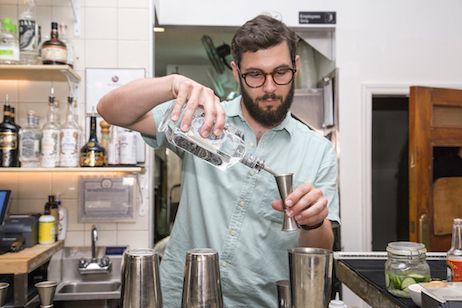 DB: Do you think baijiu has potential in the future of mixology? PS: Now people are exposed to it. People are starting to recognize what it is and the merits it has and how different it can be from itself, if that makes sense. I think the possibilities really are endless. Not only does it have a potential future, it has a definite future. It’s only just starting to happen now, but I think it looks very bright. DB: What advice would you give to those who are considering working with baijiu but don’t know where to begin? PS: Throw any preconceptions you have about baijiu out the door. Blind taste it on your coworkers and say, ‘What does this taste like?’ There’s a good chance that none of them have tried it, that some of them are trying baijiu for the first time, and that some of them have never even heard of baijiu. 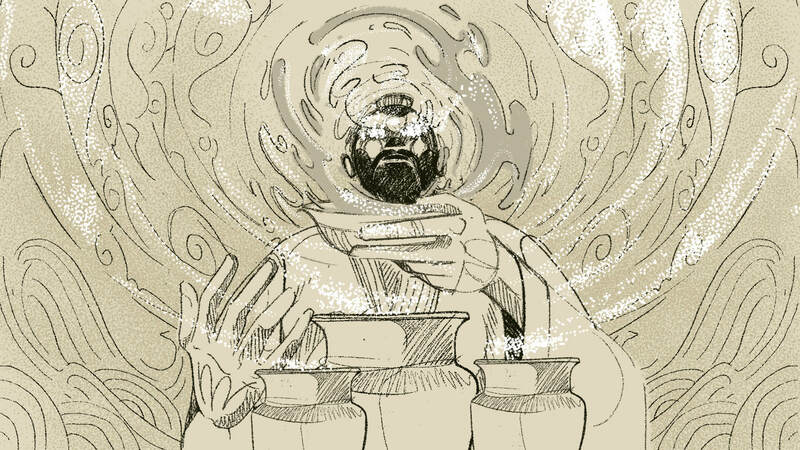 Really go in with an open mind and a clean slate, then follow where the flavors go. There are so many secondary flavors, not only in Ming River but in many, many baijius that you can pick it up as a little breadcrumb and follow it to where it takes you. But also don’t be afraid to experiment. Don’t be afraid to have those misfires. Just go in confidently, charge all the way and really go for it. I think you’ll succeed.